I'd love to try this in 2016! I don't read as much as I used to. Glad you are back for another round. Cheers to a wonderful reading New Year! Paula, jump in, start reading and see how far you get! Gagy, Sure you can. 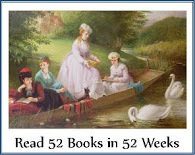 Start small and build up to 52 books. You can set your own goal.